Merge/Emerge : for string quartet / Paul Cutlan. One challenging aspect about composing a work for improvisers is that it feels 'unfinished' when it is complete - the composer has to approach the creation of the work with a trusting, collaborative outlook. In this case, I have the good fortune of being familiar with the styles and strengths of the group I am writing for. As such I have tried to imagine what each player's input may sound like and to create spaces and opportunities within the work which hopefully will excite their imaginations. The title Merge/Emerge refers to the way the main melody slowly forms from a 'primordial soup' of pitch material, before dissolving again. The pitch material is initially presented in a sort of glacial chorale, which is slowly improvised by the quartet. When the main theme does emerge, it is cast in the mold of a lyrical, neo-classical melody, accompanied by a regular pulse. Some bizarrely jazzy secondary melodies, formed from the same 'soup', function as a foil to the earnest nature of the main theme. The concepts of rhythmic pulse and unmetered chorale texture provide fertile subject material for music which endeavours to traverse a wide spectrum between fully notated and practically fully improvised. Commission note: Commissioned by The NOISE with funds provided by Australia Council.. 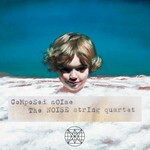 Commissioned by The NOISE string quartet, for inclusion in their CD Composed NOISE. 21 Jul 18: Sound Lounge, Seymour Centre, Chippendale, NSW. Featuring Liisa Pallandi, Lachlan O'Donnell, James Eccles, Oliver Miller.